Japanese firms operating in Vietnam are complaining about high costs, complicated taxation procedures, and difficulty in procuring raw materials, although 65.1 percent of surveyed Japanese enterprises said that they are making a profit, 70 percent of them plan to expand business and continue to consider Vietnam an important investment destination. According to a survey conducted by the Japan External Trade Organisation (JETRO), the current status of production and business activities of Japanese enterprises in Asia and Oceania has just been announced. 2017 marked an improvement in Vietnam's investment and business environment. The survey was conducted from October 10 to November 10, 2017, with nearly 12,000 Japanese enterprises in 20 countries and territories. In Vietnam, as many as 1,345 Japanese enterprises participated in the survey, of which 652 responded appropriately (48.5 percent). The representative of JETRO Hanoi pointed out the risks in the investment environment; concerns and obstacles of Japanese enterprises during the investment process in Vietnam. According to the report, 3 out of 5 criteria in investment climate are not improved but increase the level of risk. Specifically, 61.6 percent of Japanese firms said that labour costs rose sharply by 3.1 percentage points compared to 58.5 of 2016, despite the fact that labour costs in Vietnam were much lower than those of other countries in the region, such as China, Thailand or Malaysia. 42 percent complained about complex procedural taxation mechanism an increase of 3.5 percentage points compared to 38.5 of 2016. In addition, the language barrier in Vietnam is still the largest in 15 countries surveyed by Jetro; countries such as the Philippines and Malaysia have many advantages in this criterion. In recent years, Japanese enterprises investing in Vietnam are mainly small and medium ones. They tend to pour money into non-manufacturing industries, leveraging their labour force as the country's population ages. And agriculture will be the focus of investment in the future. Mr Hironobu Kitagawa, Head of JETRO in Hanoi, said that Vietnam has the strength in the field of information technology. Japanese enterprises also recognise that human resources in the field of information technology of Vietnam are developing and certainly Vietnamese enterprises will have success when investing in Japan. However, it should not be encapsulated in one area but also many other areas such as restaurant chains, traditional handicrafts and agriculture. Opportunities are opening in many sectors. In more than 600 surveyed enterprises, 62.8 percent of respondents said that they are gaining profits, up from 58.8 percent the previous year. This rate is higher than that of some countries in the region, such as Thailand or Indonesia, but still lower than that of the Philippines (77.5 percent) or China (64.4 percent). More than 60 percent of companies also plan to expand their business in Vietnam, mainly to "increase sales". Meanwhile, for non-manufacturing enterprises, the main driving force is "growth potential and high potential." 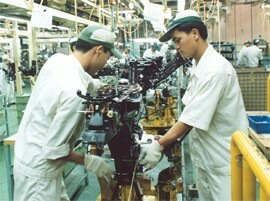 Domestic production capacity in Vietnam also improved compared to last year, at 34.2 percent. Jetro estimates that the rate is higher than that of the Philippines, but still lower than China (68 percent) or Thailand (57 percent). The agency believes that Vietnam needs to increase its localisation to reduce production costs. Japanese businesses highly appreciate the stable political and social situation in Vietnam and consider this an advantage in the investment environment. In addition, market size and the ability to grow are also attractive features. Through the survey, Hironobu Kitagawa expressed his hope that the difficulties and risks of investment environment will be recognised by Vietnam. Then Vietnam will improve the investment environment and attract FDI inflows from Japan in particular and the world in general to Vietnam.